Two pieces including; (1) Photograph Signed "James Bulger 1428AZ " with lengthy Autograph Note on verso. Black and white, 6" x 4", two side by side mug shots of Stroud taken at Alcatraz. 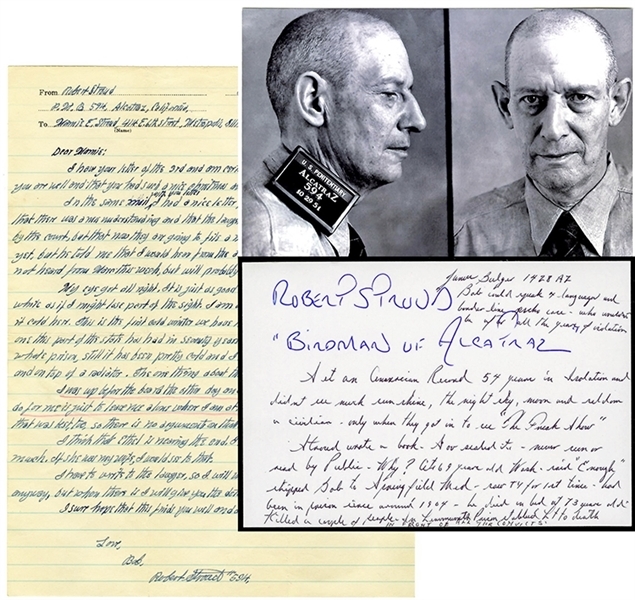 Penned on verso in unidentified hand: "Robert Stroud / 'Birdman of Alcatraz." Stroud was at Alcatraz from 1942 - 1959. His Alcatraz prison number was 594. Bulger was at Alcatraz from 1959 - 1962; his Alcatraz prison number was 1428. Fine condition. In full, "Bob could speak 4 languages and border line psycho case - who wouldn't be after all the years of isolation. Set an American Record 54 years in Isolation and didn’t see much sunshine, the night sky, moon and seldom a civilian - only when they got in to see 'The Freak Show.' Stroud wrote a book - Govt sealed it - never seen or read by Public - Why? At 69 years old Wash. Said 'Enough' shipped Bob to Springfield Med - saw TV for 1st time - had been in prison since around 1904 - he died in bed at 73 years old. Killed a couple of people - In Leavenworth Prison stabbed Lt to death in front of all the convicts." (2) Autograph Letter Signed "Love, Bob, Robert Stroud #594," 1 page, 8" x 10.25". Alcatraz, California, January 10, 1949. To his sister, Mamie E. Stroud, Metropolis, Illinois. Also signed in upper left "Robert Stroud." About his lawyers and a "new action" to be filed, his not hearing from their brother Marc, his being "up before the board … the best think the could do for me is just leave me alone where I am at … "